Only a portion of current inventories of Canadian tar sands oil might make economic sense to pipe through Keystone XL; there is a high probability that new extraction projects or upgrades to existing projects will have delivered cost well in excess of what the market will bear. An investor in the Keystone XL pipeline is making a very risky bet without a potentially large return. While the environmental concerns against Keystone certainly have merit, it makes no sense to construct simply on the basis of economics. Just run the numbers. In November 2014, Scotiabank projected the breakeven costs for Saskatchewan Bitumen and Oil Sands projects using a 9% after tax return, as shown in the chart below. Bitumen and tar sands sourced oil trade at a lower price than with crude oil. The discount varies depending on the source of the oil. Tar sands oil prices must be converted to their conventional oil equivalent price. Typically, Canadian tar sands are compared with West Texas Intermediate (WTI) crude pricing. The table below presents the Canadian Energy Research Institute (CERI) WTI Equivalent supply costs in 2011. These are weighted averages. The actual differential between extraction costs and WTI Equivalent is much broader than the differentials shown above, depending on the individual project. A fair assumption for the amount to be added to the tar sands supply cost to get to WTI Equivalent, according to CERI, is $15 per barrel. That number, however, excludes transportation costs to get the oil from upper Canada to Gulf port refineries. 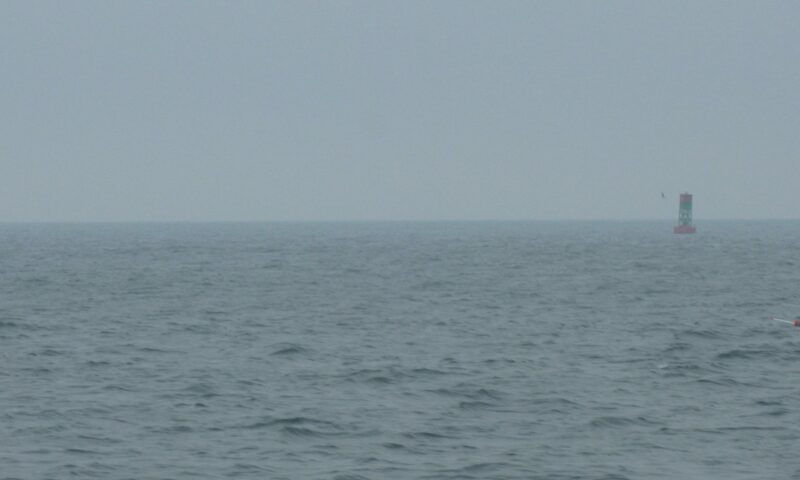 An approximate cost using Keystone from Hardisty, Saskatchewan, to the Gulf Coast was estimated by the Canadian Association of Petroleum Producers at $7.95 per barrel. Shipping by rail is about $7/bbl more. Amazingly, this is the entire rationale for Keystone XL – a $7/bbl savings! Using this equation we can take the three approximate production cost estimates shown in the first figure and develop the breakeven world market equivalent prices. The chart below plots each project type’s breakeven world market price relative to West Texas Intermediate. Over the last 28 years, new tar sands projects and upgrades to existing projects would never have been economic. 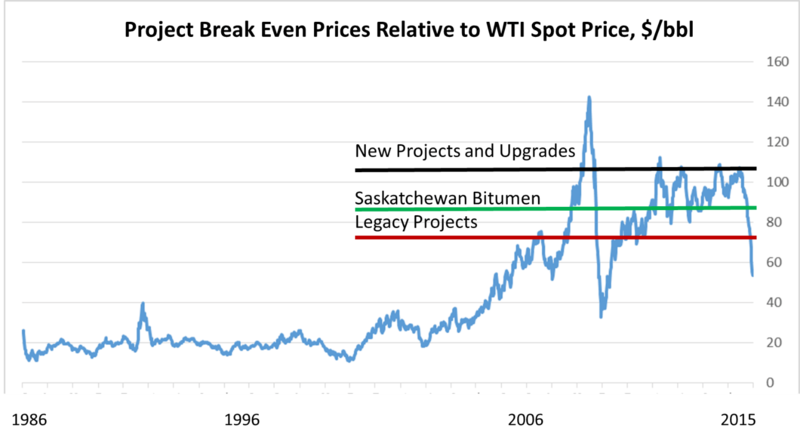 Saskatchewan Bitumen and Legacy projects only became consistently economic in 2010 but neither are economic at current market price. 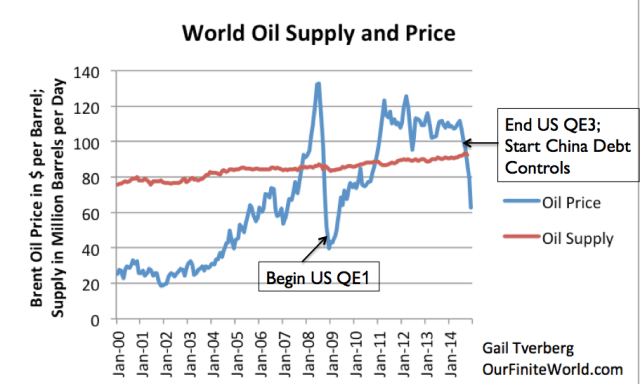 Keystone only works over the long term when WTI and global prices sustainably exceed $110/bbl. That’s the bet. In the short term, futures traders seem willing to bet on a case where prices never exceed $70/bbl through December 2023. Today’s settlement prices are shown below. Only tar sands oil from legacy projects have any probability of being economic at their cost of production, FOB Gulf Coast. That’s the simplistic approach. Other analysts, notably Gail Tverberg, see feedback loops that auger for continued lower prices for oil. Her chart below compares price, supply and major economic events. The price rise began at the same time as Quantitative Easing (QE1 on the chart); the price decline occurred as QE was tapered down (turning around artificially low interest rates) and when Chinese debt controls began (reducing the volume of Chinese debt). These events had the effect of slowing global growth, reducing demand for energy commodities and causing their costs to decline. Slower growth means less demand for oil and therefore lower oil prices. Tverberg sees increased debt defaults (especially in oil extraction); rising interest rates, rising unemployment and increased recession. These and other effects make a strong case for oil prices to remain low. The market seems to be coming to the same conclusion. A number of large oil companies have cancelled or postponed tar sands extraction projects in the last several months, in part due to an increased perception of project risk, including Statoil, Shell, SunCor Energy and Total. This brief look at the problem of Keystone only considered one narrow issue – the economics of the delivered oil. The breakeven prices for tar sands oil projects are known: how they might fair in the volatile world oil market is not. 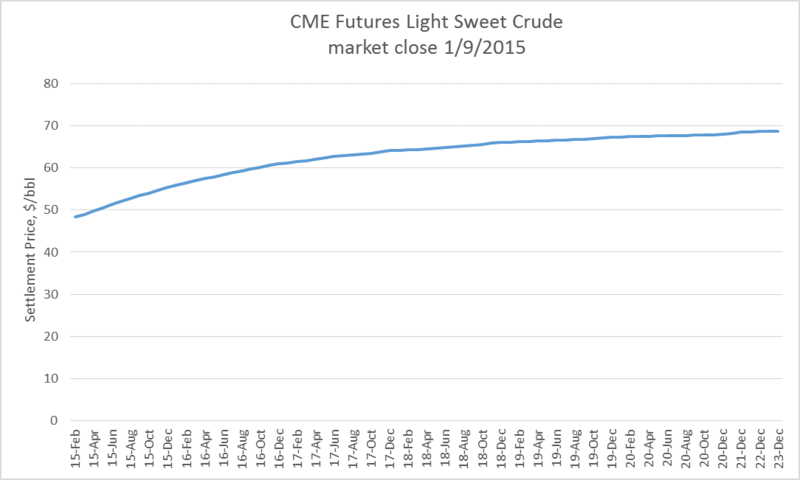 History has clearly shown us that long term oil price forecasts are always wrong. What is possible, however, is developing the probability of a trend. Absent a major disruption in oil supply or a miraculous turn around in the world’s economies resulting in sustained growth, the most likely trend is a continuation of low oil prices. If the oil cannot be sold at an economic price, why pipe it south? Indeed, if is not economic to begin with, is there not a high risk the pipeline ultimately sits idle and unused? An investment in the Keystone XL Pipeline looks to be a really bad bet. Just run the numbers!